On this extraordinary DVD, master conductor Sandra Snow outlines a new paradigm for choral teaching and rehearsing within performance - based classes. Now significantly revised and expanded, James Jordan's groundbreaking book incorporates more than ten years of new conducting insights, pedagogy, and philosophy to create a resource that is not only informative but transformative. Just as it is possible for everyone to engage in meaningful conversation, it is also possible for everyone to engage in meaningful improvisation. The selections on Musicks Empire speak for themselves, an engaging mixture of contemporary writing as well as timeless classics. The Singer's Ego is a groundbreaking book that explores the serious issues singers face, issues with profound implications for both singers and their teachers. This comprehensive and engaging sourcebook is an essential guide to a productive and musical choral rehearsal written by a leading voice in choral pedagogy. Conductors, performers, and composers will find valuable reference materials for their development and a treasure trove of inspiration to carry over into any choral endeavor. This volume and its companion for young tenors and baritones is designed to offer guidance to voice teachers in dealing with hard-to-categorize students. With time, attentive listening, and practice, you can take your conducting to the next level! Choral exercises in all the modes. Textbook, video, and exercise octavos. A collection of lectures that captures the teachings of one of the foremost leaders in choral music. The Choral Challenge is a book of solutions. Michael Kemp brings a lifetime of experience living and working in the choral world to create a truly remarkable and practical book. Written in a straightforward and direct manner, this volume provides an overview of choral vocal technique for choirs at any level of development. This book is an ideal tool for anyone who seeks a deeper understanding of the preeminent music composed for choir and who wishes to learn from some of the seminal voices in the choral profession. The first inspiring release in the GIA Choral Works series. Each piece on this recording possesses this magical quality to teach us how to live. An innovative and delightful way to introduce musical terms and concepts to children! The Long and Short of Music is 28 chapters of informative fun! 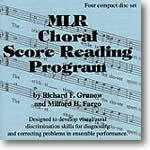 For the first time in a single volume, this book provides choral directors with a comprehensive guide to score analysis techniques used by the world's leading choral conductors and innovators. Representing the best of our American heritage, this collection of uplifting, meditative, and feetstomping folk songs is a gift children of all ages will never forget—the melodies are so strong they are sure to last a lifetime! These folksongs, handpicked by renowned conductor and composer Alice Parker, are tunes every child should know because they create a solid foundation for future music learning. This volume provides ten worthy selections appropriate for young sopranos and mezzo-sopranos that fall between these voice types, which are perfect for helping to discover a singer's eventual vocal classification. The newest release in the GIA ChoralWorks series featuring the voices of Anam Cara with James Jordan conducting. Great for warm-ups these are 21 pieces your choir will never forget, 12 accompanied in both popular and classical styles. Your choir never had so much fun being so musical! Choir directors will find these exercises to be a key component in their quest to improve the musicianship and vocalism of their singers. Teaching Music through Performance in Choir, Volume 2 aids conductors and educators on the quest toward full musical awareness. Movable Tonic is a comprehensive sight-singing resource, perfect for daily practice or an entire curriculum. Because this resource includes each of the important pedagogical steps needed to teach sight-singing effectively, your students can become independent music readers. This new, definitive choral methods text is perfect for future practitioners and an invaluable reference for any choral conductor. In this brilliant DVD, master clinician Tim Lautzenheiser speaks to the students of the Central Bucks West High School choir and band about how to bring leadership thinking into their everyday lives and music making. Teacher and Student Books cover tonic, dominant, and subdominant in major keys. Practical instruction and tips to hone your skills and improve your vocal musicianship. This book explores the history of melody and its elements regional differences in performance. Recorded in 2008 over a two-day period at the Hollywood Hills home of the composer, these colleagues and friends participated in a discussion to help conductors and choirs understand the music of Morten Lauridsen. Taking James Jordan's choral conducting book Evoking Sound to the next level, this DVD is a self-tutorial that demonstrates and enhances the basic conducting principles discussed in the book. Designed for use in schools, in churches, and with other community choirs, Voice for Life offers four levels of vocal training for beginning through advanced singers.